Easy skill transfer, video manual creation software "EduSolution"
Skill transfer software "EduSolution" can develop video manuals. These videos make it easier to understand various expert skills of the manufacturing site. You can easily make a video manual in a short time in-house, and this skill transfer software can empower trainees to absorb structured information quickly and efficiently. By using "EduSolution" skill transfer software, it is possible to expect cost reduction compared to traditional tools and allows avoidance of various risks (retirement of skilled worker, job change, death and disasters) associated with in-house skill transfer. By the mass retirement of the baby-boom generation, there is a serious problem regarding "skill transfer" in large enterprises, as well as in small to medium-sized enterprises. Companies use trial and error to find good methods for skill transfer, but most are not successful. Currently, teachers "have no time" and can not find time to hand down skills. Even if there are materials for skill transfer, they are written documentation, drawings, or photographs. It is hard for learners to understand a skill by simply viewing photographs or drawings. More recently, a method that involves photographing and editing videos with a PC has become increasingly popular in teaching skills. However, editing takes much time, and the information is not enough for skill acquisition of the learners. They are not providing satisfactory results. 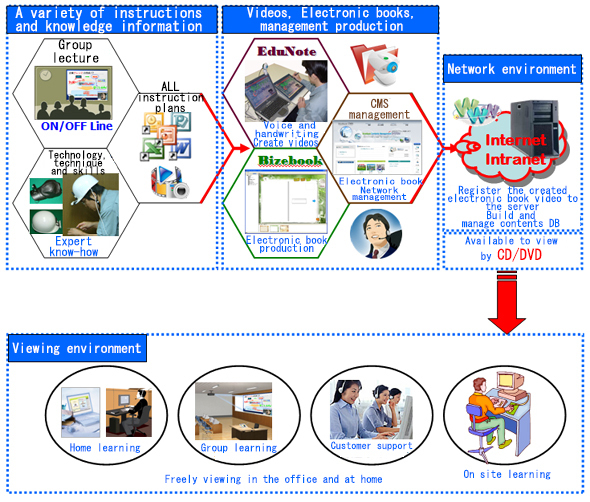 ○ Features of skill transfer (visualization) software "EduSolution"
① Capture experts' point of view. and photographs; and enables switching between them and associated videos. ○ Process flow of skill transfer (Visualization) software "EduSolution"
Copyright (c) Creation Design Co., Ltd. All Rights Reserved.